BOISE, Idaho The partial government shutdown has made the search for a Boise, Idaho woman more difficult. Jo Elliott-Blakeslee, 63, was missing at Craters of the Moon National Monument. But with 16 staff employees having been placed on furlough as the shutdown began, no one was looking for her Tuesday morning, according to Ted Stout, chief of interpretation and education at the monument. 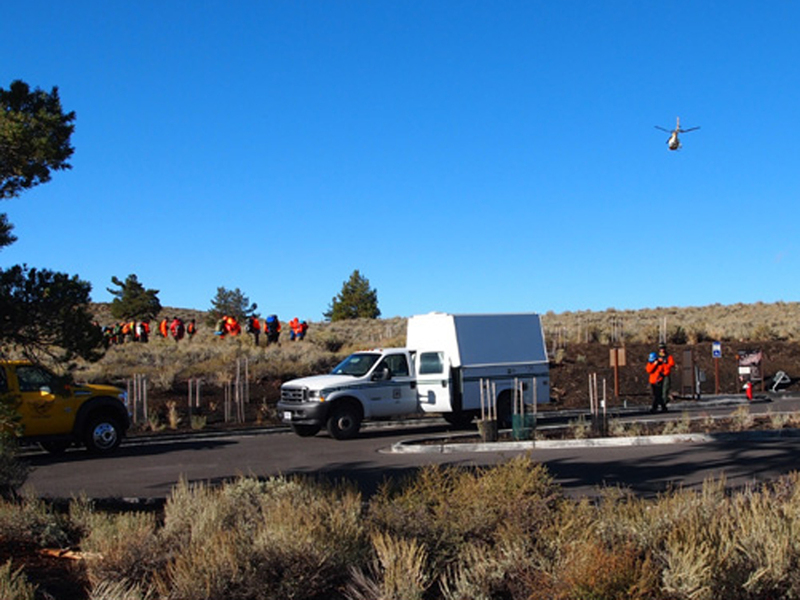 He told CBS Boise affiliate KBOI-TV a handful of staff members would resume the search in the challenging terrain Tuesday afternoon. And the Butte County Sheriff's Department tells CBS News some monument staffers and personnel from the department did start looking for her again. They were to continue the search Wednesday. "It's pretty much just park staff that are continuing the search," Stout said. "But we're also faced with the government shutdown -- we've been busy with that." KBOI points out that federal workers aren't allowed to volunteer to do their jobs during a shutdown because U.S. law says they can't do any work for which funding hasn't been allocated. The search was already being scaled back due to poor weather earlier in the week. Only three staff members were at the park, monitoring infrastructure resources, on Tuesday, the station said. Her family is asking for hikers with backcountry experience to help in the search. Elliott-Blakeslee and 69-year-old Amy Linkert were last seen on Sept. 19. Officials believe the two went for a short hike at Craters, where their pickup was found parked with their phones, purses and dogs inside. They were reported missing Sept. 23 when Elliott-Blakeslee, a physician, didn't show up for work at the Snake River Correctional Institution in Ontario, Ore. Searchers found Linkert's body Wednesday; she appeared to have died from exposure. Searchers scaled back efforts on Sunday as a storm with heavy winds moved into the area. On Monday, Elliott-Blakeslee's family released a statement thanking all those who had helped in the search and saying that, while they realize the chances of finding Elliot-Blakeslee alive were growing slim, they remained hopeful. They also noted that the search area is in rugged and often dangerous territory and prone to unpredictable weather. "Either way, we are committed to bringing her home and are actively recruiting volunteers with backcountry experience to keep the search going. But we will not chance injury or loss of searchers," the family's prepared statement said. "In that vein, at a minimum, those interested in participating should be able to hike 10 to 12 miles and climb 1,000 feet at a time in treacherous terrain." The family said that it's critical for command center officials to be able to map every step the trained volunteers take with the help of radios and GPS technology, and they're accepting donations for equipment and other resources needed by the volunteers.